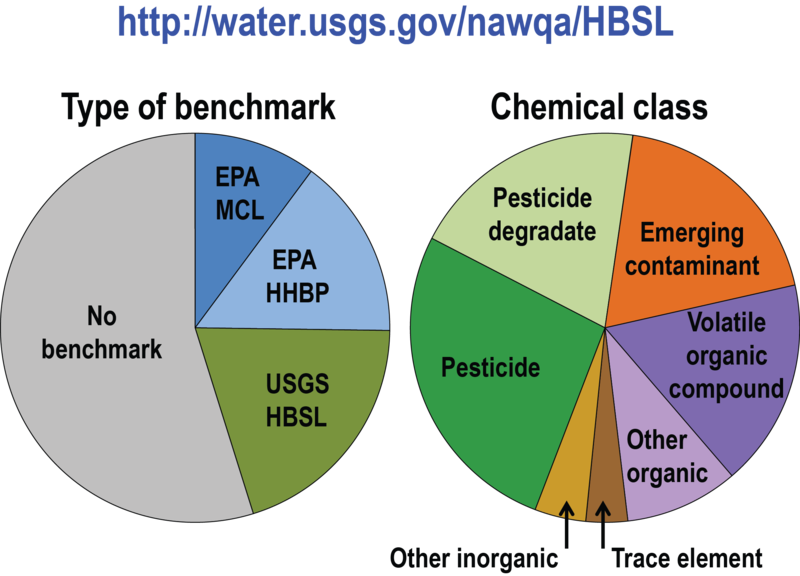 The HBSL database contains 777 contaminants currently or historically analyzed by the NAWQA Program. The database includes MCLs, HHBPs, or HBSLs for 351 contaminants. HBSLs are not available for the remaining 426 contaminants because of a lack of toxicity information. A U.S. Geological Survey USGS Health-Based Screening Level (HBSL) Web site includes human-health benchmarks for 351 contaminants (79 U.S. Environmental Protection Agency (EPA) Maximum Contaminant Levels (MCLs), 117 EPA Human Health Benchmarks for Pesticides (HHBPs), and 155 USGS HBSLs). The Web site also provides detailed toxicity information used to calculate HBSLs. A comprehensive update of the USGS HBSL database was completed in June 2014. HBSLs are non-enforceable water-quality benchmarks that can be used in conjunction with EPA MCLs and HHBPs to (1) determine whether contaminants found in surface water or groundwater sources of drinking water may indicate a potential human-health concern and (2) help prioritize monitoring efforts. 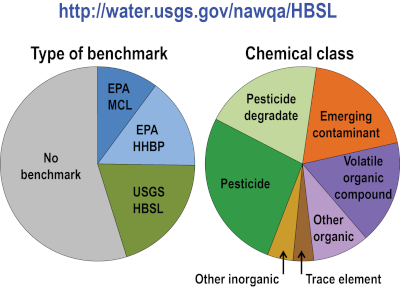 HBSLs were developed by the USGS National Water-Quality Assessment (NAWQA) Program for contaminants without EPA MCLs or HHBPs. Provide benchmarks, when possible, for 267 new contaminants analyzed by the NAWQA Program. Replace HBSLs with new EPA chronic HHBPs, when available. Be consistent with new EPA policies by calculating both cancer and noncancer HBSLs for some contaminants. This study was funded by the USGS NAWQA Program.